It sure feels like spring is MIA, but the unlikely sighting of a pair of wild turkeys in our parking lot last week gave us some hope – and some chuckles – as we watched them wander off down Outagamie Street. 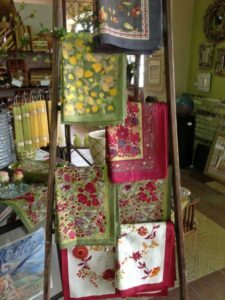 Joe has been busy displaying our new line of French inspired table linens by Couleur Nature. Stop in and see how he cleverly made use of a 12′ vintage ladder he found hanging around in our workroom. We also have newly framed artwork with lots of color and pattern – perfect for a fresh new look in any space.